Pharmacy technicians will be found working in a number of settings, and pharmacy technician industries will include hospitals, pharmacies as well as in retail where they dispense medicines, do labeling and assist pharmacists. The reason they are so sought after is because as the cost of health care rises, pharmacies are taking a more active role in the care of patients. People looking for a career in the medical field will always want to take into account the stability of the industry; the possibility of advancement and whether in five years time the business will still be in existence. Getting a job as a pharmacy technician will not only be financially rewarding, you will have a broad selection of jobs to choose from. With a shortage of pharmacists as well as a growing consumer demand for prescription medications, the pharmacy technician will have an even greater opportunity in the future to play an ever more important role in today’s pharmacy industry. Health services are one of the largest industries in the country when you take into account those they are self employed as well, and according to the US Department of Labor, employment of pharmacy technicians is expected to increase. Graduates should find employment easily with local community pharmacies, hospitals and retail pharmacies etc. The American Association of Pharmacy Technicians (AAPT) was founded in 1979, and they are an international not-profit organization dedicated to the improved delivery of pharmaceutical services. With the growth in pharmacy technologies, educational requirements are essential for pharmacy technicians. The Association recognizes the value of continuing education, and to this end they have established a Continuing Education Service and the chance for participants to get CE credits. The Association plays an active role in providing continuing education opportunities so that pharmacy technicians and always be updating their skills to keep up with changes in the pharmacy practice. The Association represents pharmacy technicians who practice in community pharmacies, hospitals or as educators. There are thousands of technicians practicing in the United States and with the evolving role of the pharmacist as a patient consultant, there is promise of substantial growth in this industry. The American Association of Pharmacy Technicians encourages recognition of pharmacy technicians as well as standardization of their responsibilities. They want to develop formal training programs and with certification, they can be sure that pharmacy technicians have a certain level of competence. pharmacy technicians also work in the retail area of the pharmacy advising customers on creams, lotions, grooming products etc. Exam for the Certification of Pharmacy Technician (ExCPT) – offered by the Institute for the Certification of Pharmacy Technicians (ICPT). Once these exams are complete, the candidate is granted certification, where after the technician will need to complete continuing education to maintain certification. Students can either receive a diploma, a certificate, or an associate’s degree. The programs offered can last anything from six months to two years after which the pharmacy technician will have a certificate or diploma. Some state make getting a certificate voluntary while other states require a certificate. The programs will include a mixture of lab work, medical ethics, record keepings and medical terminology. Students wanting to write exams will require a high school diploma or GED. Technicians must be re-certified every 2 years which requires twenty hours of continuing education within the 2-year certification period. For more information on Pharmacy Technician Training, you can look at www.pharmacy-technician-salary.org for more information. To become a pharmacy tech, you need to pass certain requirements, and each state has an exam that you will need to pass. With certification you become part of the medical industry as a pharmacy technician. Flexibility is the draw card for these programs and training can be done from any computer that has an Internet connection and access to the course work and assignments. Online training is very similar to that of attending classes. Must A Pharmacy Technician Be Registered? 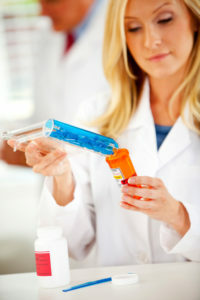 Registration as a pharmacy technician became mandatory in July 2011. This is to ensure they have the approved competency based qualification and have completed a minimum of 2 years relevant work-based experience. Anyone working in Pharmacy Technician Industries will need to be registered. Anyone who is not registered but practices as a pharmacist or pharmacy technician, or refers to themselves as such, is breaking the law and can be prosecuted. CphT stands for Certified Pharmacy Technician. Pharmacy Technician industries have different educational and certification requirements which are set by each state’s Board of Pharmacy. Pharmacy technicians will need to be certified within 2 years of registration with the Division of Professional Regulation. The Pharmacy Technician Certification Program is accredited by the National Commission for Certifying Agencies and technicians who pass the ExCPT Pharmacy Exam will be given the title of Certified Pharmacy Technician. To perform any duties in a pharmacy, the pharmacy technician or pharmacy technician trainee must have an active registration with their state Board of Pharmacy. There are some states that require that their pharmacy technicians get fingerprinted first, and in fact applications will not be processed until fingerprint results are received. The Pharmacy Technician Board develops and administers a nationally accredited certification and re-certification program for pharmacy technicians for the benefits of patient safety. The pharmacy technician certification program will enable technicians to work more effectively with pharmacists in the delivery of safe and effective patient care. Certification is achieved by meeting specific eligibility requirements. The candidates’ competence will be assessed by the Pharmacy Technician Certification Board and all procedures are directed by a council of expert pharmacists and pharmacy technicians. Graduates are prepared for national certification which is offered by the Pharmacy Technician Certification Board. With certification the technician will certainly enjoy increased pay and more flexibility to choose from a wider selection of jobs. Data from the Bureau of Labor Statistics shows that training as well as the salaries for pharmacy technicians varies significantly from state to state. As with all medical training, it pays to get tuition from a reputable and accredited school. Financial aid is available at most pharmacy technician schools, allowing students to pay far less or even nothing for their tuition. Many pharmacy technician schools offer extensive financial packages, and for students who don’t qualify for grants and scholarships, there is the option of student loans. Pharmacy technicians play an important role in the medical industry; handling a wide assortment of essential tasks that the pharmacist would never be able to handle in the course of the day. Although it is mandatory in some states to be registered, there are other states that do not license, register, or certify Pharmacy Technicians as there is no legal requirement. However they still require that candidates for pharmacy technician industries be 18 years of age, possess a high school diploma, pass an examination approved by their state’s Board of Pharmacy and also submit to a criminal records check. The industry associated with study will focus around the relevant drugstore ethics and pharmaceutical practices. Completing internships may be required as part of the training and accreditation by a local or national pharmaceutical Drug board may also be required; but if it is not, it is in your best interests to get yourself certified and this tells future employers that you are in fact competent to do the job of a pharmacy technician.